The San Diego City Council Natural Resources and Culture Committee (NR&C) approved on Wednesday (May 23) two substantial reports that recommend how recycled water can be used more effectively in the future as San Diego struggles with ways to reduce its extreme dependence on imported water that is becoming an increasingly expensive and less reliable source [link to the agenda]. 2011 Recycled Water Master Plan Update [link to the report]. Recycled Water Study [link to the report]. 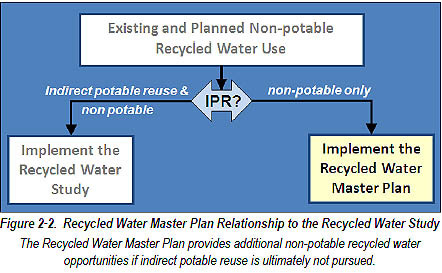 According to the Recycled Water Master Plan, its purpose “is to evaluate opportunities to maximize non-potable reuse [of recycled water treated to tertiary standards] if IPR (Indirect Potable Reuse) projects are not pursued” [emphasis in italics is mine]. 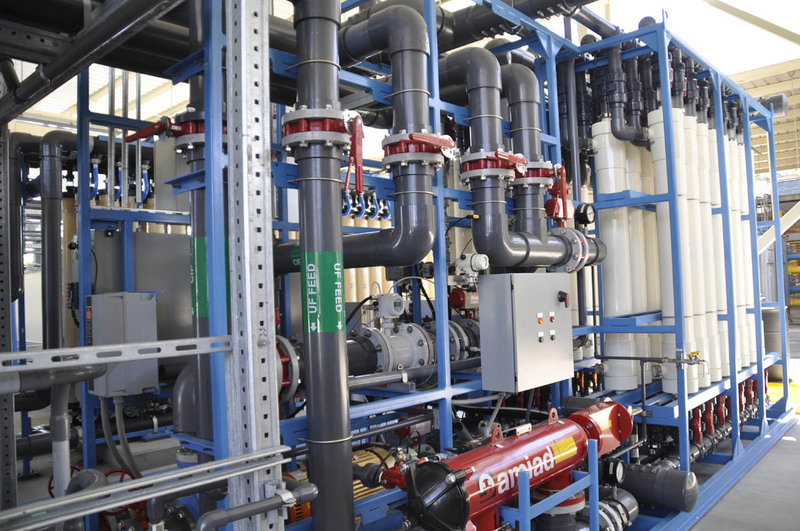 IPR refers to a series of advanced treatment processes applied to the tertiary water that results in purified water that is in essence distilled water and then to store that water in an underground aquifer or to blend it with imported raw water in an above-surface reservoir. Nonpotable recycled water, of course, is limited to use in specific agricultural, irrigation, and certain industrial settings. A separate pipeline infrastructure must be built to deliver that water (“purple pipe water”), and you definitely can’t drink it. This blog post, therefore, focuses on the subject of the companion to the Recycled Water Master Plan, the City of San Diego’s Recycled Water Study. After considering a number of options, the Recycled Water Study mainly examined two possible ways IPR projects can be pursued in San Diego: 1) use IPR water to recharge groundwater resources, or 2) mix it with imported water that is piped into and stored in local reservoirs (sometimes referred to as “reservoir augmentation”). IPR, as you probably know, results in water that is of higher quality than the water we import from the Colorado River and Northern California and it can be used for any purpose, including for drinking, and delivered using our existing potable water infrastructure. Another option examined in the Recycled Water Study, Direct Potable Reuse (DPR)–which would deliver the purified recycled water directly into the water distribution system instead of mixing it with imported reservoir water—has not been well-studied and would be difficult to implement without the development of new statewide regulations, so the study concludes it is not on the table for the near future in San Diego. The Recycled Water Study envisions that continuous increases in the price of imported water along with decreased reliability and availability of imported supplies will soon make the relatively expensive IPR process competitive with imported prices (it’s already competitive with, if not cheaper than, the cost of desalinated water)…and will eventually be dramatically less expensive than imported supplies. The Recycled Water Study was the outgrowth of an agreement between San Diego Coastkeeper, the San Diego Chapter of the Surfrider Foundation, and the City of San Diego, whereby the environmental groups agreed not to oppose the EPA’s Regional Water Board’s, and Coastal Commisssion’s approval of San Diego’s Clean Water Act waiver that allows the Point Loma Wastewater Treatment Plant to continue discharging into the ocean the sewage receiving only Advanced Primary instead of Secondary treatment. The waiver expires in 2015, with an application due a year before expiration, so time is of the essence. If San Diego chooses not to pursue upgrades to the Point Loma treatment plant to full Secondary treatment standards before the expiration of the current waiver, there is widespread speculation that the governmental agencies are not likely to renew the waiver and the city could face huge financial penalties AND be faced with a full upgrade to the treatment plant. Upgrading Point Loma to Secondary treatment at its current load would be exceedingly expensive partly because of the large wastewater flow it receives and partly because there’s little room to expand on the limited hillside space it occupies facing the ocean along Point Loma’s western slope. So…the Recycled Water Study envisions that if enough water is recycled, particularly via the advanced IPR treatment process, a good deal less wastewater would be sent to Point Loma. Point Loma then would be burdened with treating less wastewater and it would be much less expensive to upgrade to Secondary treatment standards. In that scenario, the city could even apply for federal financial assistance to upgrade Point Loma to Secondary treatment. If nothing is done and the waiver expires, the city would face large fines, be forced to upgrade to Secondary treatment at greater ratepayer expense and would not be eligible for federal financial assistance. The Recycled Water Study concludes that groundwater recharge opportunities are extremely limited given San Diego’s geography. As such, using IPR water for reservoir augmentation is the most realistic option for San Diego to incorporate purified recycled water into its its potable water portfolio. Therefore, a Water Purification Demonstration Project examining the feasibility of using the IPR process focusing on reservoir augmentation by the City of San Diego is currently underway. 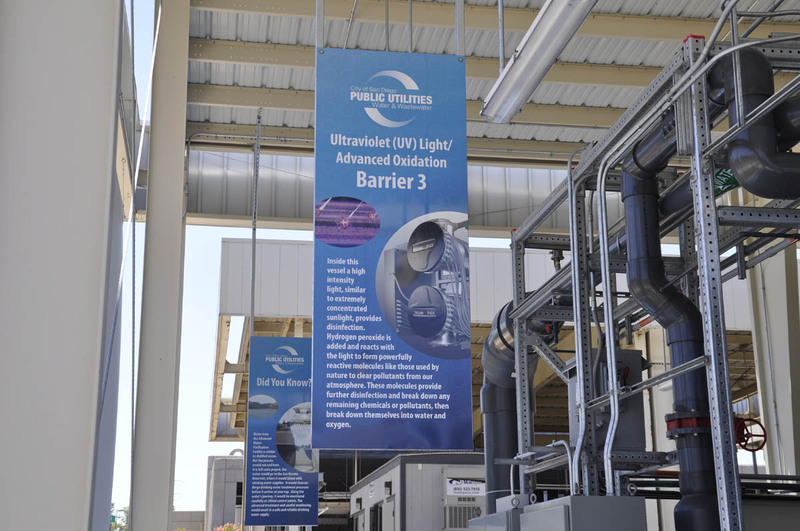 A prototype advanced treatment facility at the North City Water Reclamation Plant is producing a limited amount of IPR water while a parallel scientific study is being conducted on the feasibility of blending IPR water with imported water in the San Vicente Reservoir. When the Demonstration Project is completed, a number of unfinished regulations and guidelines addressing IPR must be approved by federal, state, and local agencies before San Diego can implement IPR reservoir augmentation on a large scale. One problem with the NR&C vote on Wednesday, though, is that the committee simply “approved” both reports to advance to the City Council. The motion to approve both plans made no recommendation as to which plan to implement; that is, whether to commit to nonpotable recycling in the future, or recommend a combination of nonpotable recycling and IPR projects. There was, however, some indication of the direction towards which the committee leans on this question. During discussion before the vote, Councilmember Sherri Lightner appeared to favor developing a balanced plan, incorporating nonpotable and potable recycled water, especially since a significant amount of nonpotable water infrastructure already exists and there are contracts and plans already in place to expand that form of recycled water use. Another issue is that the Recycled Water Study raises the possibility of a much larger capacity facility to produce the advanced treatment product water (or several new satellite IPR facilities) to achieve a goal of producing as much as 100 million gallons per day (GPD) of IPR water, and it implies that because the San Vicente Dam Raise Project will more than double the capacity of the reservoir, there would be capacity to handle it. That raised a question in my mind, which I decided to ask during the public comment portion of the NR&C meeting: the fact being that the County Water Authority (CWA) is building the San Vicente Dam raise and it will own the rights to the additional capacity. Would CWA buy IPR water from the city or fill it with imported water? And if all the water in the reservoir will be mixed, would it then be delivered to all the CWA member water agencies…and would they be agreeable? I also suggested that due to the close proximity of El Capitan Reservoir (currently San Diego’s largest), why not consider using both San Vicente and El Capitan as receiving reservoirs for IPR water? Later, during committee discussion, Councilmember and committee chair David Alvarez asked PUD staff about that. Assistant PUD Director Marsi Steirer allowed that San Diego would only be adding IPR water to the portion of the reservoir capacity that the city owns…and that if the city eventually did produce up to 100 mgd of IPR water, its portion of San Vicente reservoir could consist entirely of IPR water. My question regarding El Capitan was not addressed at that time, but I’ve since learned it was a point of discussion during production of the report. There are two principle reasons El Capitan Reservoir is not as good a choice for reservoir augmentation as San Vicente Reservoir: storage volume and distance. The greatest value – the best use – of El Capitan Reservoir is to capture local runoff. The El Capitan Catchment [the land area that drains to the reservoir] generates the greatest amount of runoff of any reservoir in the San Diego region. In our region rainfall and runoff are highly variable. Much of El Capitan’s runoff occurs in the occasional high rainfall year; something like two years per decade have abundant runoff and the reservoir fills up. We then store this runoff water for use over several years. For this reason, our operational scheme for El Capitan is to keep storage space available in the reservoir in anticipation of high runoff years. The average runoff to El Capitan is 28,000 AFY. San Vicente Reservoir, on the other hand, is primarily filled with imported water. The San Vicente Catchment does not generate much runoff. The average runoff to San Vicente is 4,000 AFY. Basically, we keep San Vicente full with imported water and El Capitan relatively empty to capture local runoff. So, while El Capitan has a large total capacity [113,000 AF] the amount of water typically stored there is relatively small. The average long-term storage in El Capitan is about 40,000 AF. Compare this to the average storage in the future expanded San Vicente of about 180,000 AF. San Vicente is a better choice for reservoir augmentation simply because it is larger. El Capitan, because it stores a smaller volume, does not offer the same level of retention, blending, and response time. Constructing a pipeline to carry IPR water to El Capitan would be a difficult and costly endeavor. Conveying IPR water from North City to El Capitan would require eight to twelve miles of additional pipeline, and it would necessarily route through difficult terrain and environmentally sensitive areas. Councilmember Alavarez also commented that he believes that IPR is 100% the only solution he believes will work to solve the issue of increasing local water supply and reliability, as well as dealing with the Point Loma plant upgrade. It’s not certain when this item will be docketed for the full City Council, but a condition of the Coastal Commisssion’s approval of the last waiver was that the Study be presented in approximately two years, and that deadline is fast approaching. The City is also pressured to act quickly, because even if the Demonstration Project concludes successfully and the city promptly moves to develop a large-scale IPR operation, it certainly won’t be finished, and most likely construction wouldn’t even be started, by 2015. Therefore, the only way for the City to be assured it will qualify for one or more additional waivers would be to get an approval and timeline in place to implement a significant amount of IPR, and thus justify the delay in upgrading the Point Loma treatment plant. This entry was posted on May 24, 2012 at 8:27 pm	and is filed under Environment, Water, Water Purification Demonstration Project. Tagged: Purified recycled water (indirect potable reuse), Recycled water, Recycled Water Master Plan Update, Recycled Water Study. You can follow any responses to this entry through the RSS 2.0 feed. You can leave a response, or trackback from your own site. Section 301 (h) of the Clean Water Act (the provision that allows modified discharge permits (waivers) to be granted) is absolutely silent on water re-use. The primary conditions of a waiver are pre-treatment (which the City does), treatment to certain standards (Pt. Loma operates at advanced primary which exceeds the legal requirements of treatment for a waiver), no new or substantially increased discharges (the City’s permitted discharge quantity is well higher than the actuals. Water conservation has been helpful, but even before the big push to conserve, discharge volume was well below the permit level), and monitoring of impacts on the environment from the discharge (San Diego has one of the most comprehensive and robust monitoring programs in the nation). Nowhere is there a legal connection to re-use. The only requirement from EPA for the City to re-use water is in Section 301 (j). That required the City to achieve a system capacity of 45,000,000 gallons of reclaimed waste water per day by January 1, 2010. A provision we met (North City and South Bay Reclamation Plants). There is some question as to the State’s ability (thru the CA Coastal Commission) to require re-use as a condition of determining federal consistency. However, if you followed the last waiver process closely, you probably know that the late CCC Exec Director provided guidance to his board, on several occasions, that if the Board took that action, they would likely be subjecting themselves to litigation, for which they did not have a strong foundation. Ultimately, the CCC approved the consistency determination with the only condition being that the City report back on the final Recylced Water Study. Despite the CCC’s best efforts, the City was successful in ensuring that that condition did not have any implementation requirements. The City agreed to that condition and did not contest it, though it had a legal right to do so. So, all this is to say that it’s not really accurate to state that implementation of any sort of water re-use is the only way the City would be assured it will qualify for more waivers. It may be the only way certain organizations don’t submit letters of opposition to a waiver application, but fortunately they don’t’ have any legal authority over issuing permits. To be more accurate, the only way Pt. Loma will qualify is if the City continues to operate Pt. Loma within the conditions of the current NPDES permit and in full compliance with the Clean Water Act. If it fails to do that, future waivers are certainly at risk. Thanks for clearing that up Brent. If you haven’t already, you may want to check out AB 2398 (Hueso), introduced Feb. 24, 2012: http://www.leginfo.ca.gov/pub/11-12/bill/asm/ab_2351-2400/ab_2398_bill_20120224_introduced.html. Status is here: http://www.leginfo.ca.gov/pub/11-12/bill/asm/ab_2351-2400/ab_2398_bill_20120525_status.html.